The osteosynthetic supply potentials with the DMS are not restricted to the traditional indicative areas in the pertrochanteric region. 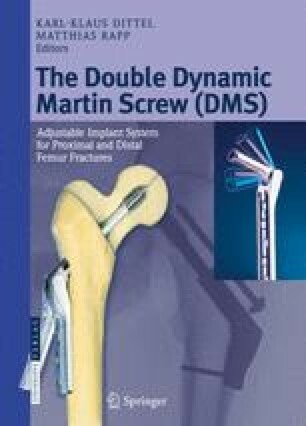 Within the framework of the standard indications, all intertrochanteric femur fractures (type 31 A 1.1-3 and 32 A 2.1-3) can be ideally treated by means of the DMS. After the application of the supporting screw, the valgisation angle can be adjusted to the required angular degree according to the specific requirements of each patient with an intact lateral corticalis by the means of an adjustable worm gear. Thus additional infractions and fractures in the trochanteric or subtrochanteric area can be avoided.